Malaysia Airlines’ recent history has seen it face many challenges. Five years ago, flight MH370 disappeared and a few months later flight MH17 was shot down. More recently it underwent multiple corporate restructures, saw the resignation of its CEO Christoph Mueller after a short tenure, and has found itself embroiled in a scandal over an untrue story about a pork dish in an inflight meal. New analysis from YouGov Plan & Track reveals how the public – both in Malaysia and across neighbouring countries – views the carrier. Malaysia Airlines’ Index score, which measures overall brand health, remains high amongst Malaysians, and currently stands at +32.3. However, the same cannot be said among its Southeast Asian neighbours. While Indonesians’ perceptions of the brand are still in positive territory (+3.8), Singaporeans take a more negative view, with the brand’s Index score currently at -9.7. 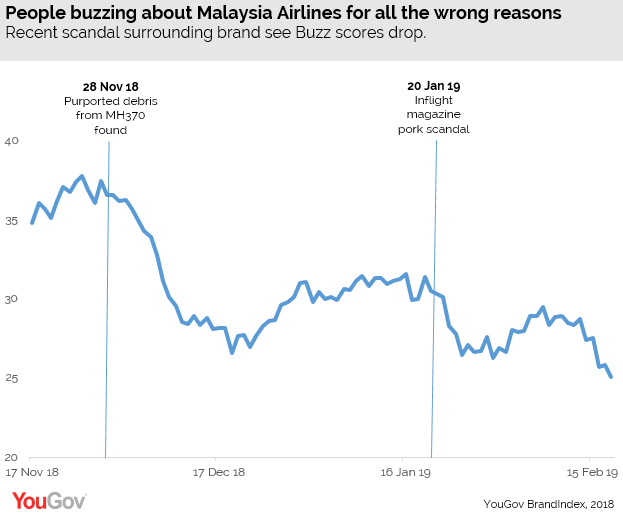 However, even amongst Malaysian consumers, the airline’s recent scandals have seen its brand Buzz scores (which asks which people have heard something positive or negative about the brand in the past two weeks) fall. On 28 November 2018, in a development that was widely covered in the media, debris purportedly from missing plane MH370 came to light. Subsequently, there was a dip in Malaysia Airlines’ Buzz score. In the fortnight after the news broke, its score fell from +37.4 to +28.4. On 20 January 2019, the brand was (incorrectly) accused of publishing an image of a pork dish in its inflight magazine, something which is a huge faux pas in Muslim-majority Malaysia. Though Malaysia Airlines issued an apology for the confusion, its Buzz score subsequently declined from +30.5 to +26.5 in less than a week. Even with the brand’s recent announcement on 12 February 2019 that it will launch a sub-brand, ‘Amal’, to provide Hajj and Umrah pilgrimage flights to Saudi Arabia, Malaysia Airlines’ Buzz score continues to slip among Malaysian consumers. However, although it has faced some turbulence recently, Malaysia airlines maintains a loyal audience. YouGov Profiles data reveals that the brand’s current customers are most likely to be married men aged 30 to 44, who work full time and earn more than RM10,000 a month. By comparison, its former customers are more likely to be young, single, women (aged 16 to 29).